Powers/Abilities: The Warlord has no superhuman abilities. Apart from being a good leader, and terrorist, he was skilled in the martial arts and the use of swords. History: (Super Soldiers#6(fb)/7(fb)) - The Warlord was with Chang Kai Shek's nationalists during the Chinese Civil War before working for Hydra. He then exterminated the Mnnzz' Guthir tribe of the Savage Land, except for their Princess, Xantia. Warlord then stole their land, and in the process made an enemy of the Princess. He set up a base of operations in a prehistoric temple complex built by the Eternals. (Super Soldiers#6(bts)/7(bts) - The Warlord was organizing a Martial Arts Tournament in the Savage Land. Xantia had become a problem, so he sent HYDRA operatives to ambush her. She killed them all, and discovered about the tournament. Meanwhile, his recruiter approached the Guvnor and Dragonfly. They, and various other great fighters, took part in the pre-qualifying rounds, before travelling to the Savage Land. 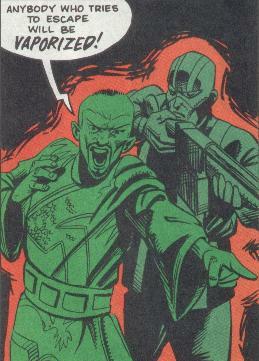 (Super Soldiers#7) - The Warlord greeted the contestants and revealed that the tournament would be to the death. He laid on entertainment for the competitors. That night, his operation came under attack from SHIELD (Strategic Hazard Intervention Espionage Logistics Directorate). Unbeknownst to them all, SHIELD had been supplied information regarding genetically engineered "super-poppies" (synthetic opium derivative) by the Mandarin and Shinobi Shaw, who wanted the Warlord operation destroyed for their own reasons. Xantia seized her chance and killed the Warlord, and SHIELD torched the fields of opium. Comments: Created by Lee Stevens and Andrew Currie for Marvel Uk. While the Warlord stated that the purpose of the martial arts tournament was to find the greatest martial artist on earth, he didn't say what he wanted with the winner. I imagine once the winner had been paid his $50,000,000 prize, Warlord would have approached him to be his personal bodyguard or assassin, as the rest of his HYDRA cannon fodder/goons/operatives weren't exactly that tough. To find the greatest martial artist on earth without inviting such characters as Iron Fist, or Shang Chi may seem strange, but I'm sure they would have soon teamed up and taken the Warlord down once they noted HYDRA's involvement, something Warlord would have realised. For more info on some of the tournaments combatants see Len Arkwright an the Lawnmower. When Warlord slaughtered Xantia's people apparently he used laser guns while the tribal folks only had swords. Xantia turned the tables on him, and when he drew his sword to face her in combat, she blasted him. The specific episode has another claim to fame - it's the only documented case (afaik) where a comedy show literally caused someone to die laughing. As confirmed by his wife/widow, one viewer found the proceedings so hilarious that he spent the entire length of the 25 minute show laughing uncontrollably, the strain finally triggering a swift and fatal heart attack. The widow wrote to the show writers (who were also the actors) thanking them for making her husband's last minutes on Earth pleasant ones. Hiro Sugiyama, also known as the Lawnmower, was champion of illegal death-sumo for over a decade. He was one of the combatants to make it to the Savage Land for the Warlords Savage Land Invitational martial arts tournament. Not only that, he seemed to be the only one not to be bothered that the fights would be to the death, obviously something he was used to. While he displayed no super human powers, he was undoubtedly very strong. His sumo wrestling skills would have enabled him to take on opponents with greater strength and use it against them to a certain extent. Another combatant in the Savage Land Invitational, Len came from County Durham, and was one of the last practitioners of the ancient Northern English fighting art of Ecky Thump, which originated in Lancashire. He was dressed in the traditional flat cap, string vest, baggy pants and hobnailed boots often associated with this deadly martial art, and presumably carried the favoured weapon of all Ecky Thump practitioners: black pudding.